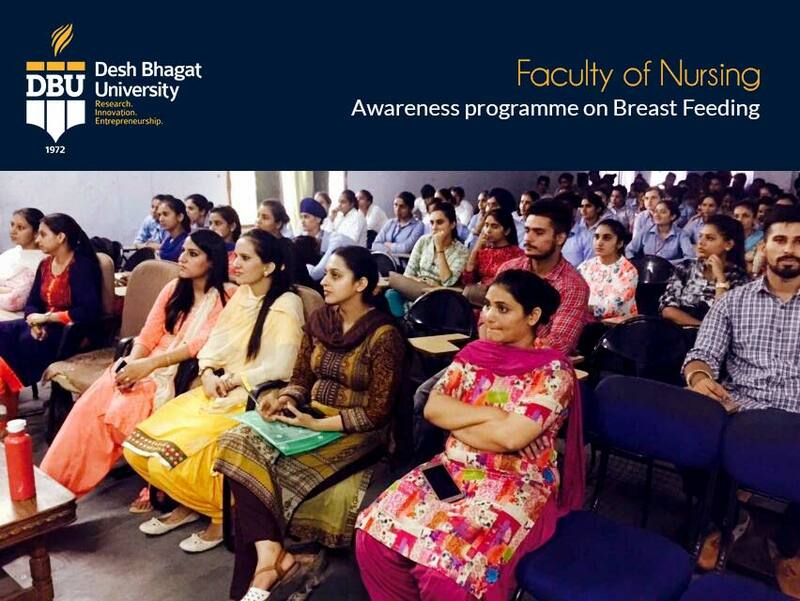 Among Top Nursing Colleges in Punjab, Desh Bhagat University Faculty of Nursing students organized an awareness programme on Breast Feeding. The programme was aimed at creating mass awareness regarding the importance of mother's milk for the children. The week long programme highlighted the benefits of breast feeding in growth and development of the children. The experts explained in detail how mother's milk created immunity in the children to fight a number of diseases and how it contributed to the physical and mental health of the new born babies. Giving more details, Dr. Ramandeep Kaur Dhillon (Director, Faculty of Nursing) informed that to make people aware, nursing students visited some local areas in the form of mini rallies and they were holding Colourful banners and placards with awareness messages. Apart from this, the students also performed a play on breast feeding and provided awareness about the importance and advantages of breast feeding for mother as well as for children. Vice Principal Deepak Kumar Shandilya said that an inter college Quiz and a poster making competition were organized for B.Sc. Nursing, Post Basic Nursing and GNM students. Ms. Khushpreet and Sunaina scored First and second position in poster making competition respectively. “Team” C was awarded as the winner of quiz competition. The respective students were awarded by the authorities. Desh Bhagat University Chancellor Dr. Zora Singh and Pro Chancellor Dr. Tajinder Kaur appreciated the students for their efforts to make the community aware by organising such events. They also exhorted the students to start a decisive drive against drug abuse through posters and awareness rallies.